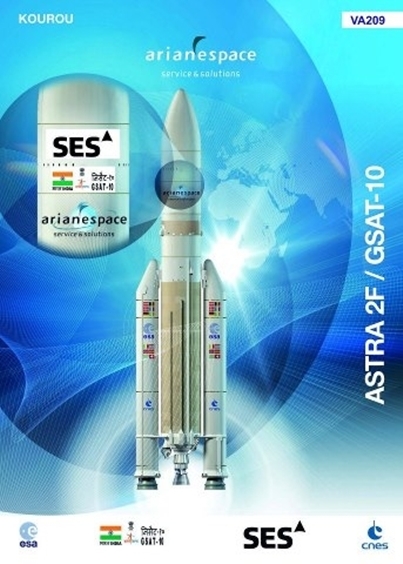 Astra 2F is one of the Astra communications satellites owned and operated by SES, launched in September 2012 to the Astra 28.2°E orbital slot. The satellite provides free-to-air and encrypted direct-to-home (DTH) digital TV and satellite broadband services for Europe and Africa. 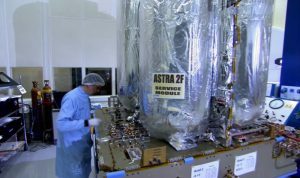 Astra 2F is the first of three ‘second generation’ satellites for the 28.2°E position and it will be joined in orbit by Astra 2E and Astra 2G in 2013 and 2014, respectively. 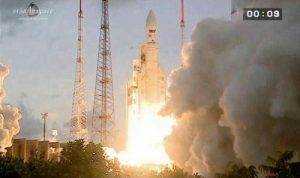 Astra 2F was successfully launched from Kourou in French Guiana on September 28, 2012, and underwent in-orbit testing at 43.5°E. Commercial operations at 28.2°E began on November 21, 2012. Astra 2F is also designed to provide SES Broadband’s first commercial Ka-band satellite broadband service in Europe, with a Ka-band payload delivering high-speed Internet access (at download speeds up to 20Mbit/s) along with VoIP, and IPTV. 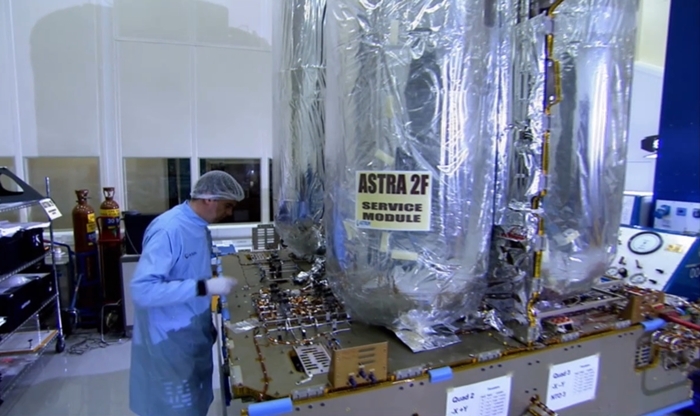 All Astrium communications satellites are assembled, integrated and tested in cleanrooms at the company’s Toulouse site, the component parts having arrived from sites in the UK, France, Germany and Spain. The AIT process lasts between six and nine months, depending on the complexity of the satellite. Satellites cannot be tested in flight, so tests have to take place which simulates the extreme conditions of the launch and orbital environment as realistically as possible. The fifth Ariane 5 mission of 2012 delivered a pair of telecommunications spacecraft to geostationary transfer orbit on September 28, 2012, marking the 65th launch to date for Arianespace’s heavy-lift workhorse. Lifting off in late afternoon sunlight at 6:18 p.m. from the Spaceport in Kourou, French Guiana, Ariane 5 deployed its ASTRA 2F and GSAT-10 satellite passengers during a flight lasting approximately 30 minutes. This timing prior to sunset provided a clear view of Ariane 5’s trajectory as it cleared a low cloud deck and continued the ascent, enabling tracking cameras to view the solid propellant booster’s separation at an altitude of 67.5 km., as well as the payload fairing’s jettison at nearly 110 km. above French Guiana. The launcher’s total payload lift performance was more than 10,200 kg. – which included a combined mass of some 9,400 kg. for the two spacecraft, along with Ariane 5’s multi-payload dispenser system and associated integration hardware. Chairman & CEO Jean-Yves Le Gall said that tonight’s mission marked the 51st consecutive success for Ariane 5, demonstrating Arianespace’s unrelenting efforts to ensure reliability for its customers that is unequalled in the launch services industry. 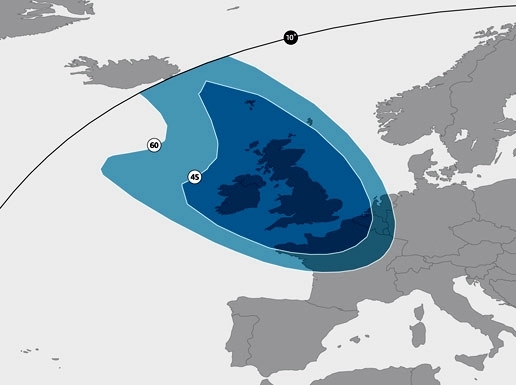 The UK Spot beam provides maximum signal (40 cm dishes) over the UK and Ireland in close approximation of the UK Beam of Astra 2D, which it replaces. Due to the tight footprint, some reception issues for UK channels are being reported in some areas of mainland Europe. 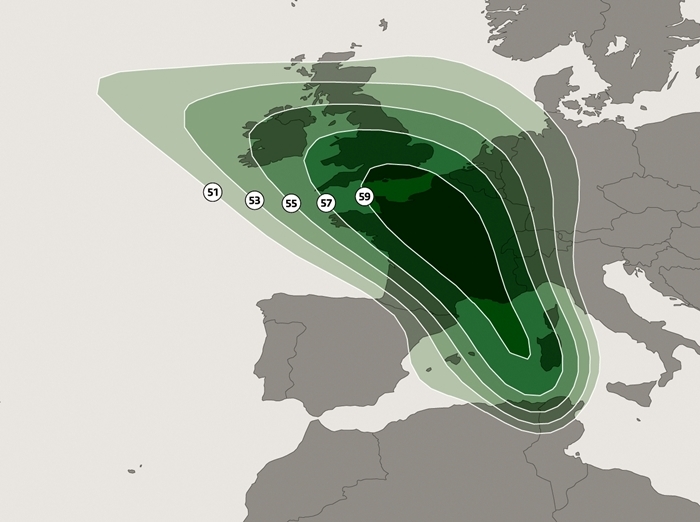 The Ka-band footprint for satellite broadband provides full service coverage across western Europe from the UK and France in the west to Czech Republic, Austria, Croatia and Bosnia Herzegovina in the east. Astra 2F provides SES Broadband’s first commercial Ka-band satellite broadband service in Europe, with a Ka-band payload delivering high-speed Internet access (at download speeds up to 20Mbit/s) along with VoIP, and IPTV. 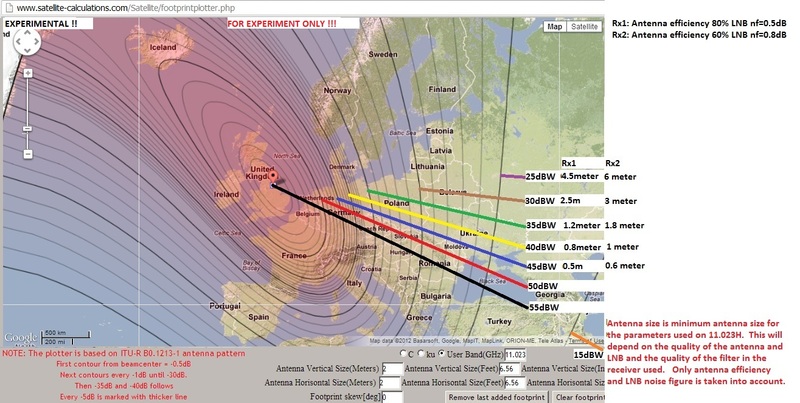 The Pan-European beam is centered on the English Channel with maximum signal (for reception on a 40 cm dish) over the UK, Ireland, France, Benelux, and parts of Germany, Austria, and Spain, and reception on a 1m dish extending to North Africa, Poland and the Balkans. 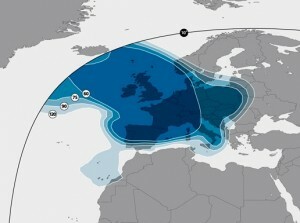 Astra 2F West Africa Beam. 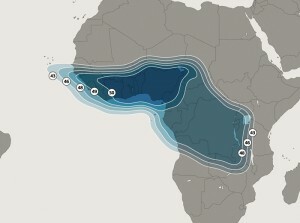 The West Africa beam provides for reception with 60 cm dishes across southern West Africa from Senegal to Nigeria, with a lower signal level (80 cm dishes) extending across the Democratic Republic of Congo.